Discover 2,500 years of history as you travel to Uzbekistan. Minarets soar into the sky, mosques and madrasas sparkle in the sunlight, and hospitality is tradition! Let the breathtaking natural beauty of Uzbekistan astound you. The Kyzyl Kym desert connects the ancient cities of Khiva and Bukhara. In Khiva the inner city walls that defended the city from invaders date from a thousand ago. It's one of the best preserved cities of the Silk Road, distinguished by its blue mosaic tile work. Bukhara is a treasure of historic monuments, lively bazaars and living history, where culture, trade and art merged and flourished throughout the millennia. Enjoy Registan Square in Samarkand, a triumvirate of buildings that reflects the ancient architectural and cultural traditions of Uzbekistan. Here you'll find the grave of Timur, the national hero of Uzbekistan. Experience Kazakhstan, the ninth largest country in the world with a welcome just as large! Stunning landscapes and ancient architecture conjure images of nomads and warriors, falconry and poetry, silk-robed equestrians and exotic beauty. In Turkestan much of the traditional architecture is attributed to the great Timur himself. Explore the former capital, Almaty, situated at the foot of the Zaili Alatau Mountain Range. Its gardens, parks, and remarkable promenades are perfect for daydreams and evening strolls. Enjoy the modern marvels of Astana, Kazakhstan's brand new capital city, which fuses modern comfort with ancient steppe glory. Thrill to displays of traditional horsemanship, or immerse yourself in rich ornamentation created by skilled artisans – Kazakhstan has something for everyone. Adventure across the grand, rugged landscapes of Kyrgyzstan. The 80 different nationalities who call it home are warm and inviting, whether from a yurt hut or a Soviet-style apartment complex. The Tien Shan Mountain Range dominates the northeast horizon and is a popular destination for springtime rafting, summertime trekking, and wintertime heli-skiing. Journey to the beaches of Issyk Kul (Warm Lake) which, although surrounded by snowy mountains, never freezes. Enjoy the verdant scenery of the many luxuriant pastures and orchards that dot Kyrgyzstan's valleys and of the capital Bishkek, one of the greenest cities in Central Asia. Originally a caravan rest stop, it is now a bustling shopper's delight with bazaars offering exotic food and fruits, colorful clothes, porcelain, woodcarvings and embroidery. Tajikistan is a remote, mountainous country to the southeast. The land retains its Persian culture, visible in language, dress, and architecture. Touch the "Roof of the World" as you climb the Pamir Mountains, famous for their glaciers and glittering alpine lakes. 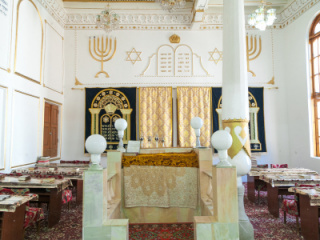 Follow the European-style streets of the capital Dushanbe, or stop in a chaikhana (traditional teahouse) for tea, sweets, handicrafts and gossip. Explore the ruins of Penjikent, once a thriving Silk Road center and now a rocky archaeological treasure. Every part of Tajikistan offers unparalleled opportunities for the outdoor enthusiast and the uncommon traveler, both of whom will be met with unmatched hospitality. Like a legendary Turkmen carpet the landscapes of Turkmenistan unfold in never ending variety. Investigate a mysterious country that has recently reopened to the international community. With magical Akhaltekin horse races, skilled artisans that love to show and teach and bustling bazaars redolent with spices, carpets, and tradition, Turkmenistan's magnificence will astound you. See the whole city of Ashgabat at your feet from the top of the Arch of Neutrality. This capital of Turkmenistan is a haven of museums and bazaars and even has a casino! Cross the walls into Merv, once known as the "Queen of Cities", just one of the many archaeological sites scattered throughout the country, whose natural beauty ranges from mountains and deserts to forests and plains. 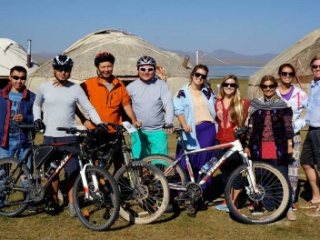 Whether you want to explore Kazakh steppe, Kyrgyz Mountains, Tajik glaciers, Turkmen deserts, or Uzbek cultural centers, Silk Road Treasure Tours can make your travel dreams a reality. Find your magic carpet in Central Asia – yours forever.